SEO continues to be a daunting task that many website owners don’t want to tackle on their own. But I am here to tell you that you can tackle your website’s SEO. You just have to do it one step at a time. And one of those steps is to SEO your blog posts. Now before we even get started, you need to have Google Search Console. This is the base of your SEO strategy. Without it, all your work will be a waste of your time. 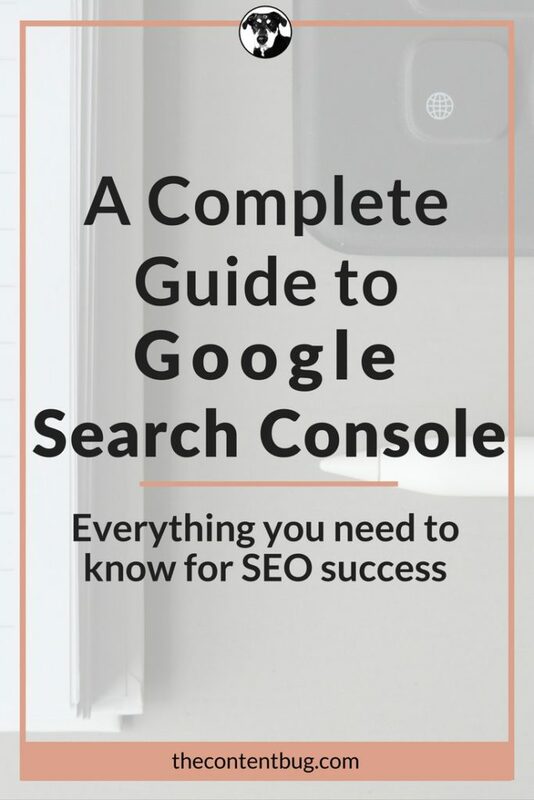 So if you don’t have Google Search Console set up yet, then you need to jump right over HERE to follow my Complete Guide to Google Search Console. This blog post covers everything you need to know to set your website up for SEO success. Now that everyone has Google Search Console, are we ready to get started? Keep reading if you want to learn how to SEO a blog post TODAY! This is a highly talked about subject. And I don’t want to go too into detail for this blog post. But you need to know the difference between WordPress.com and WordPress.org before you try to SEO your blog posts. WordPress is highly regarded as one of the best platforms to use for website SEO. Sure, you could use any other website builder, and they might be easier to design the website. But if you want to do any SEO work, then you need WordPress. But what many people don’t tell you, is that you need WordPress.org. WordPress.com is just like every other website builder. WordPress gives you the hosting and the website building abilities, but it does not give you access to the full capabilities of WordPress. And with WordPress.com, you cannot perform the proper SEO work for your website. WordPress.org is the self-hosted version of WordPress. And with WordPress.org, you can do just about anything! You gain access to thousands of Plugins that help your website in many ways. And one of those plugins that you need for your website’s SEO is Yoast SEO. So if you want to learn how to SEO a blog post, then you need Yoast SEO. And to get Yoast SEO, you need a WordPress.org site. Everything that follows in this post will address how to SEO a blog post with a WordPress.org site. And with that said, I am very sorry that I cannot help other people that use different website builders! But just know this, WordPress is the best website builder to use if you want your SEO to succeed. You’ve probably heard of Yoast SEO before. And maybe you already have it downloaded! If you do, you can just skip this section and jump to How to SEO your blog posts! But, if you do not have the Yoast SEO plugin, then you need to download that right now! 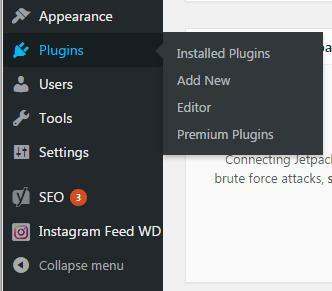 Once you log into your WordPress dashboard, you will see a Plugins option on the left sidebar. Click on Plugins and more options appear just to the right. Once Yoast is downloaded, you will need to activate the plugin. Go ahead and click on the ‘Activate’ option. And now you are ready to start with the SEO work required to SEO your blog posts! There are 3 main steps that you need to do to each blog post to consider it “SEO’d”. Before you even start to write your blog post, you need to determine your focus keyword. And this could be as simple as the topic of the blog post. Or you could think of it as the problem you are solving for your audience. And if you know anything about keywords, you know that you want to focus on long-tail keywords. So it is better to think of your keyword as “keywords”. Let it be a few words combined that make up your keyword. 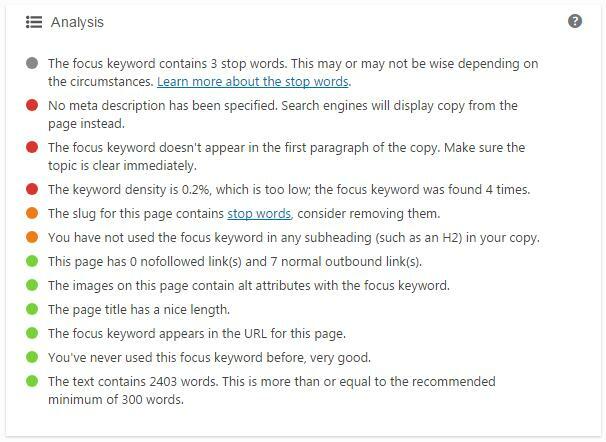 And it is as simple as this: my focus keyword for this blog post is “How to SEO a blog post”. 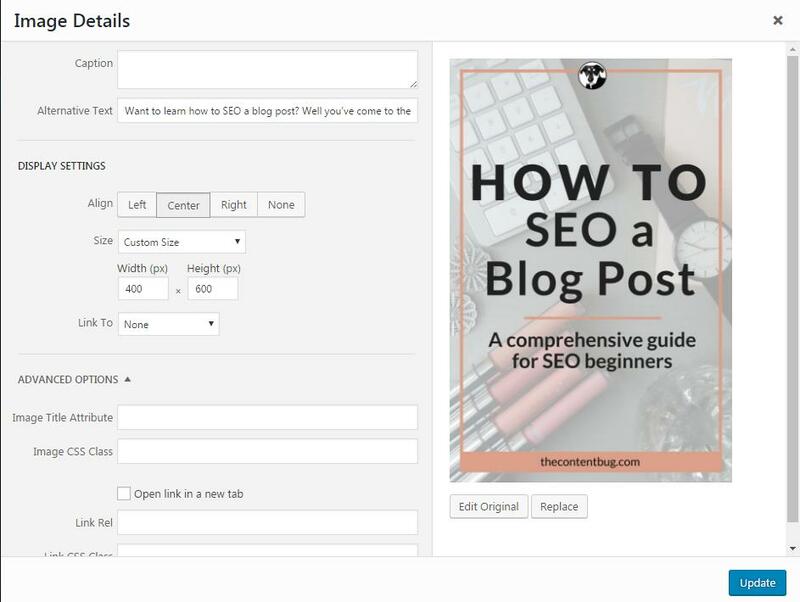 But here is the important thing about your keyword, it needs to fit in the title of the blog post, in the content of the blog post, and in the description of your images. So if you pick a whole sentence to be your focus keyword, it might be doing you more harm than good. So start to be strategic when you pick your keywords. Think of this as the reason you are writing the blog post. You are writing the blog post to talk about that one topic or to solve one specific problem for your audience. DO NOT lie to yourself and come up with a keyword that is not relevant to the content. Because if you are lying, Google will notice. So be honest with yourself and be honest with Google. Now that you have your focus keyword, you can start with the alt text of the images you include in your blog post. When you go to upload an image to WordPress, a box appears with all the information that is attached to that image. And one of those options is Alt Text. Now here is where it gets tricky. Alt text is different for each type of image you include in your blog post. So let’s say you have images that are placed on the blog post to be shared on Pinterest, Twitter, Facebook, and LinkedIn. Those images need a different type of alt text compared to the images that simply show someone how to do something. Let’s take a look at an example from my website. In each blog post, I include a horizontal image and a vertical image that are meant to be shared on social media. Both of those images get the same type of alt text. And here’s why. When someone goes to pin one of my blog posts, the description that appears with that image comes from the alt text that I enter. So I need to make sure that my alt text for that Pinterest image contains a great description that entices people to read my blog post! And those descriptions need to include the focus keyword of the blog post. Now let’s take a look at images that are used to support the content of my blog post. Nothing fancy, right? With my generic images that do not plan to be shared on social media, I do not give detailed descriptions for my audience to read. Because honestly, my audience will never see this alt text! They will only see the alt text attached to the social media image. So it is okay to just include alt text that describes that one image, not the whole blog post! And you do not have to include the focus keyword in these image’s alt text. See the difference between the 2 types of alt text? Because there is a big one! SUMMARY: For the images you plan to be shared on social media, the alt text needs to be a longer description with the focus keyword. For images that support your content, the alt text needs to just describe that 1 image. 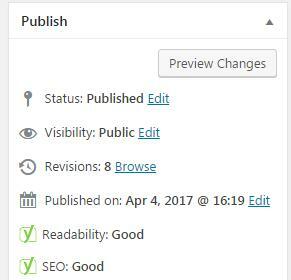 Now it is time to get back to the Yoast SEO plugin you downloaded earlier. 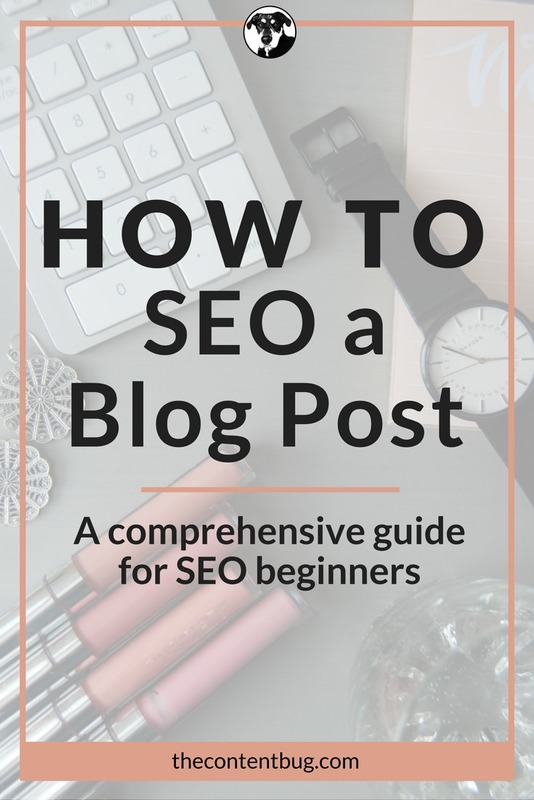 Once you complete every blog post, you need to do a little work in this section to make sure your blog post have the proper SEO information. If you do not see all the options in that image, click on the “Edit snippet” option! The first thing in that box is the SEO title. This is how your title will appear on search engines and on social media. Normally, it will look like gibberish in the SEO title box. But the part that you want to pay attention to is the Snipper Preview. If the title in the Snipper Preview is exactly how you want it to look, then don’t worry about the SEO title section. But if you want to make your SEO title a little different than your official blog post title, then you want to change this section. BUT I want to warn you, that this is not recommended. The only times that I make my SEO title different from my blog post title is when I want to add more information. 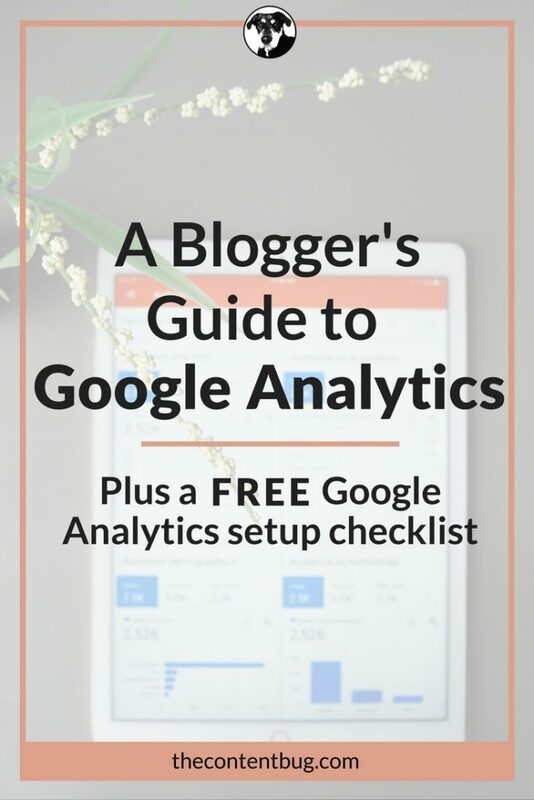 So for my Blogger’s Guide to Google Analytics, my blog title was “A Blogger’s Guide to Google Analytics” and then my SEO title was “A Blogger’s Guide to Google Analytics: Plus a free Google Analytics setup checklist”. The next section you need to pay attention to is your Slug, your slug is the URL link that is attached to your blog post. This is automatically generated for you based on the title you give your blog post. But sometimes, the generated slug is terrible! If you have a long blog title, then you do not want that whole title in the URL. You need to shorten it. And that is where this option comes in. Let’s say my blog post title is “How Tailwind Helped to Increase my Blog Traffic by 191%“. I want to remove all “stop words” and shorten the URL to make sense. In the end, my slug section looked like “tailwind-helped-increase-blog-traffic”. That looks much better to readers than having the whole blog title in the URL. You can change the slug at any time. But I recommend only changing it before you publish your post! Otherwise, you risk having bad links or redirects on your website. So make sure that you have the URL you want for your blog post before you hit publish. TIP: You want your focus keyword to appear in the slug. Now we jump to one of the most important sections. The meta description is the 2nd impression you give to your audience. First, they see your blog title, then they will read your meta description. And if neither of these is cutting it, then they are likely to just skip over your blog post without reading it. 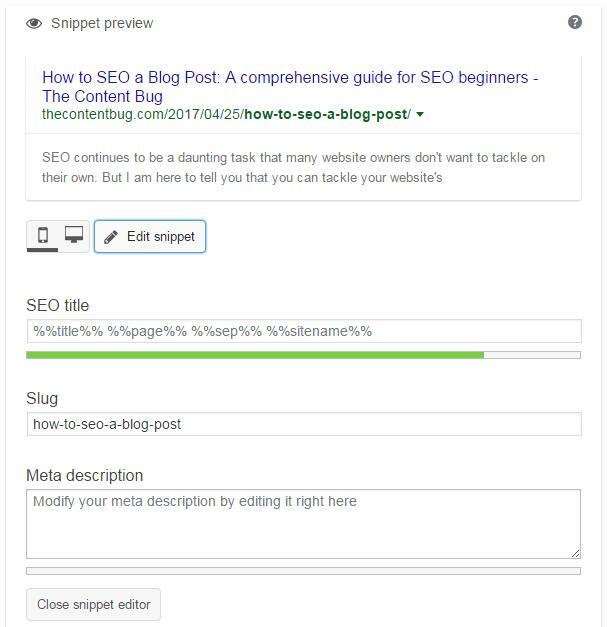 So you want to make sure that your meta description not only informs Google about the content of your blog post but also entices users to read it! You only have 150 to 160 characters for a meta description. And as you start to type in the box, the bar along the bottom will turn from red to orange to green and maybe even back to red. You need to hit the sweet spot and have that bar stay in the green. Green just means that your description is the right length and will not get cut off by Google. Also, you need to make sure that you include your focus keyword in the meta description! This is extremely important for your SEO success. And last, remember that focus keyword we keep talking about? I know, I know, I’ve talked about it a lot… it is nearly impossible for you to forget about the focus keyword. Well, once you are finished with the 3 sections above, then you will find the Focus keyword section. Go ahead and enter your focus keyword in the box provided. Once you have completed everything above, it is time to look at your SEO analysis that is provided by Yoast. In the section under the Focus keyword section, you will see a list. Consider this list your checklist for great blog post SEO. You need to strive to have each of the items on that list appear with a green circle before it. 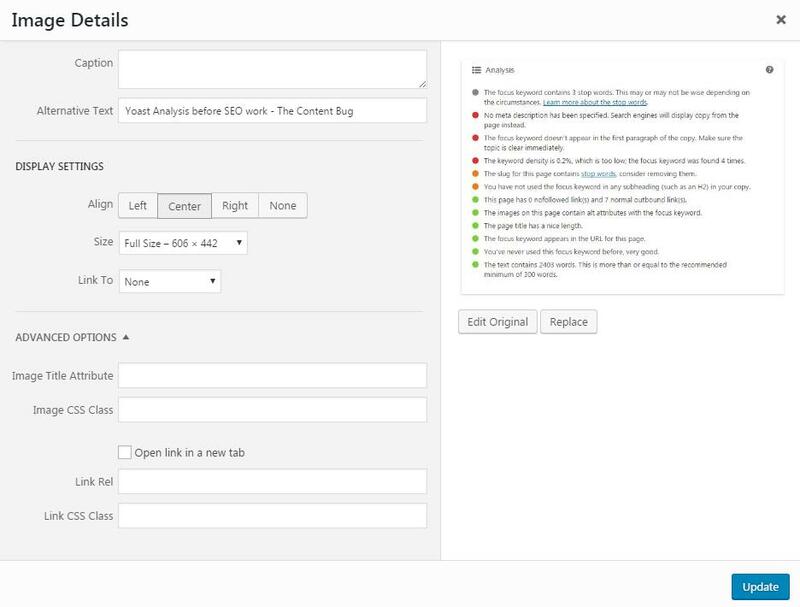 This is a screenshot of my analysis right after I entered the blog post and included the focus keyword. I did not add a meta description and I did not customize the slug yet. So clearly you can see that I have some SEO work to do with my blog post. But now you know, that before you even start to SEO, the circles will appear all different colors based on the requirements you meet. But it is your goal to have the majority of those circles to appear green. If they are gray, red, or orange, you need to try to fix the problem. And you might not be able to fix all of the problems, and that’s fine! You do not need to have every light turn green. You just want the majority of them. At the top of your blog post, on the right side, you will see a box that says publish. This is where you go to publish the blog post! So you should be familiar with this box. In this box, you will see the Yoast icon with an SEO score. It will either appear, gray, red, orange or green. You want it to read Good with the green Yoast icon. Like in the image above. And the only way to make this happen is that the bottom analysis appears to be mostly green. If it is mostly orange, or a mix of all colors, then your SEO score will be OK or Bad. You always want to strive to have the best SEO ranking possible! Now go ahead and give yourself a pat on the back. Because this was a long blog post and you stuck with me through the end! 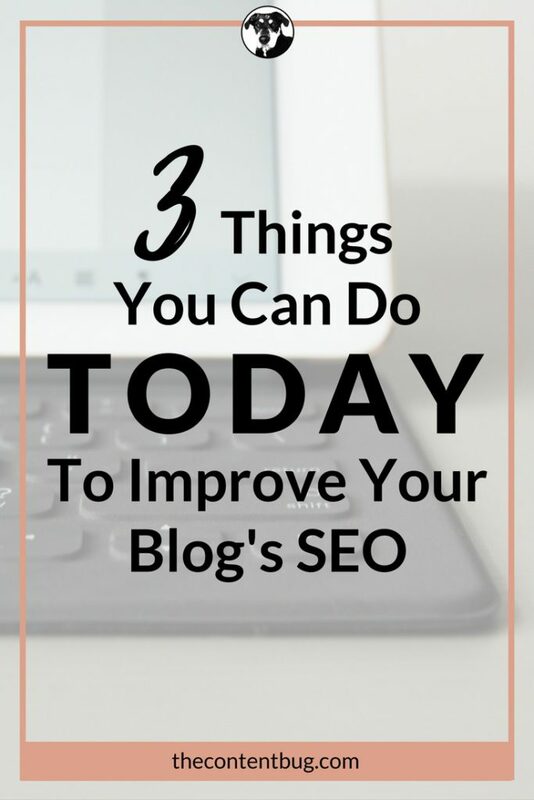 I hope that you found this helpful and you get started SEO-ing all your blog posts today and in the future. What is your biggest struggle to get the green SEO ranking? Let me know in the comments below! 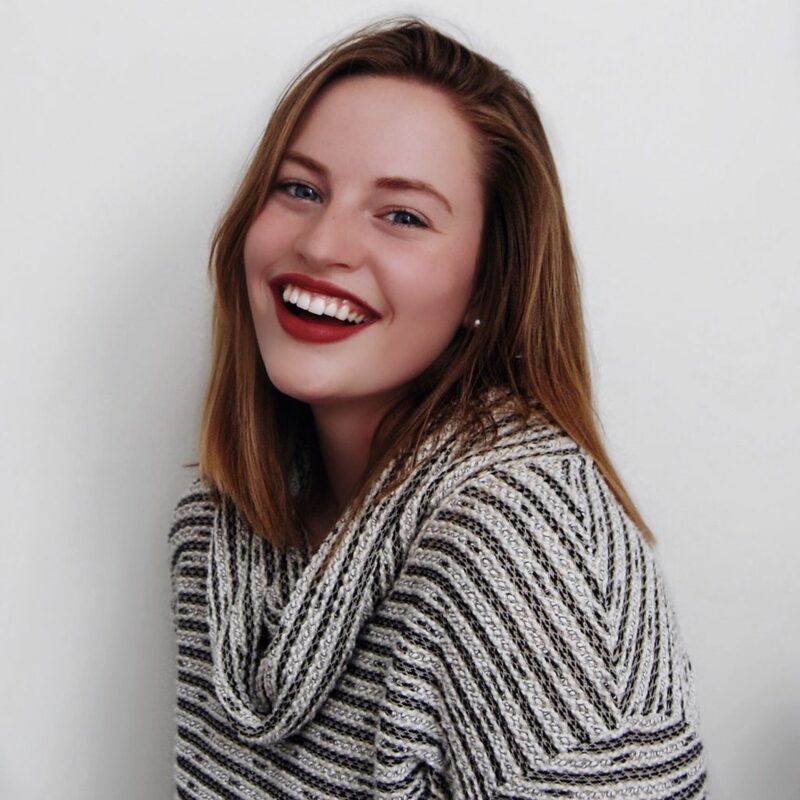 Hey, Cathrin! I’m not sure if you’ll see this comment since this post is older, but I found this so helpful! I’ve read through a few of your posts about blogging and I love in-depth you go. So many posts I read from Pinterest are so obviously just to make the sale, and they keep all their “blogging secrets” to themselves! I did have a question though that I haven’t yet been able to figure out, after hours searching. Is there a plugin to get the proper image to appear (and that image only) when a reader hits the “share on Pinterest” button? I’ve tried and tried and haven’t been able to find a solution. Thanks in advance! I currently used the paid version of the Social Warfare plugin because it has an option where you get to select what Pinterest image you want people to pin. And then when they click on the Pinterest share icon at the top or side of my blog post, only 1 option appears. It’s only $29 a year if you want to try it out! Just Google “Social Warfare Pro”. Thank you, Cath! This information was actually extremely helpful! The Yoast SEO thing always confused me and I wasn’t sure what all of those dots next to the SEO “checklist” meant, or that all of them COULD turn green. This will really change the way I post to my blog. Thank you for being willing to help other bloggers. I really appreciate it! I’m glad that you found this post helpful! Basic SEO is definitely easier than most people believe it is! Thank you so much for the effort you put on this post ! Unfortunately I use blogger, but this tips were really helpful either way ! Oh, I’m sorry! But I’m glad that you still found ways to make the post useful. SEO standards apply to all websites so things such as alt text are important no matter what platform you use!